After four hard-fought days of play, Vitaly Lunkin made it through one of the toughest fields ever assembled for a no-limit hold'em tournament, outlasting exactly 200 other competitors to take the gold bracelet for Event No. 2, the $40,000 buy-in Special 40th Annual No-Limit Hold'em Event. 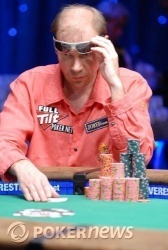 The win marks Lunkin's second WSOP bracelet. Isaac Haxton was the chip leader when the day began, with Ted Forrest and Noah Schwartz sitting on the short stacks. Both Forrest and Schwartz went out early, then Lex "RaSZi" Veldhuis followed them to the rail after pushing all in with only to run into Greg Raymer's pocket kings. That hand gave Raymer the chip lead, and the Fossilman was still in the top spot as Alec Torelli fell in sixth. Then Lunkin gradually began chipping up past Raymer and toward the eight million-chip mark, winning almost all of his pots without showing a hand. Justin Bonomo was the next to fall after shoving his stack on a ten-high flop with pocket jacks and getting called by Haxton who held . The remaining four battled through the dinner break and for more than forty hands altogether before Dani "Ansky" Stern was bounced when his couldn't catch up to Haxton's . After a few hands of three-handed play, Raymer, Haxton, and Lunkin all had almost exactly 8 million-chip stacks. With all three having almost exactly 50 big blinds each, it appeared we might be seeing a lot more poker before losing another player. But suddenly a huge pot developed between Haxton and Raymer, with all of their chips going in the middle on the strength of Haxton's pocket nines and Raymer's pocket fives. No five came to save Raymer, and the Fossilman hit the rail in third. When heads up play began, Haxton had a bit more than a 2-to-1 chip advantage over his Russian counterpart. But it only took Lunkin seven hands to wrest the advantage away from Haxton. About an hour later, Haxton won nine straight hands and retook the lead. A sequence of huge, dramatic hands followed. First Lunkin doubled up to take the lead. Then Haxton hit a five-outer on the river to top Lunkin's pocket aces and retake the advantage. Then Lunkin doubled again. Finally, a short-stacked Haxton ran into Lunkin's aces, and this time couldn't catch the needed cards to crack them. Congratulations to Vitaly Lunkin, champion of Event No. 2, the Special 40th Annual No-Limit Hold'em Event. 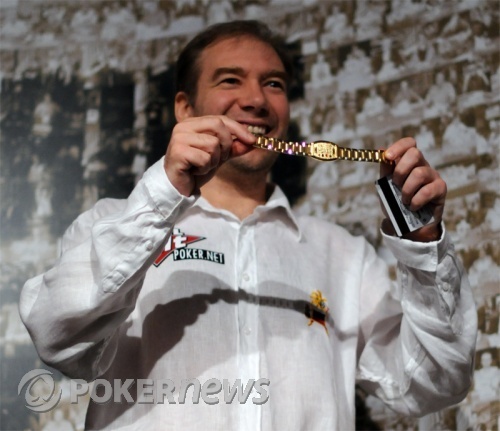 Besides the gold bracelet, Lunkin earns a cool $1,891,012 for his efforts. Thanks for following along with our coverage, and be sure to come back to PokerNews to follow the fifty-plus more bracelet events yet to come. Vitaly Lunkin has the button. He limps in and Haxton raises an additional 600,000. Lunkin makes the call. The flop is . Haxton leads out for 1,200,000, Lunkin moves all in and Haxton calls all in for 5,635,000. The turn is the , no help for Haxton, who needs a diamond, an eight or a three to keep his bracelet hopes alive. The river, though, is the and Vitaly Lunkin wins the tournament, his friends rushing the table to embrace him. They wrap Lunkin in a Russian flag as they celebrate. 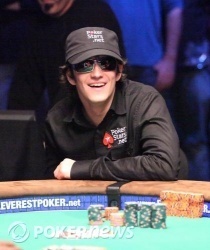 Haxton earns $1,168,566 for his runner-up finish while Lunkin takes home $1,891,012 and his second WSOP bracelet. Isaac Haxton has the button. He limps in and Lunkin checks his option. The flop is and Lunkin check-folds to Haxton's 325,000 bet. We've now seen exactly 50 hands of heads up. Safe to say the last 10 have been somewhat more exciting than the previous 40. It has been about three hours since heads up play began. Isaac Haxton has the button. He makes it 400,000 to go and Lunkin reraises to 1.4 million. Haxton calls and they go to the flop. The flop is . Lunkin leads out for 2,000,000, Haxton moves all in and Lunkin calls. Haxton is in dire shape here and needs to hit an eight or running non-club straight cards to survive. And the turn is... the . Even Haxton can't believe it, his jaw hanging open in amazement. However, the river is the and the room explodes as Lunkin makes his flush, decimating Haxton's stack. He's left with 5,505,000 while Lunkin has the rest, 18,590,000 in all. Vitaly Lunkin has the button. He limps in and Haxton raises to 800,000 total. Lunkin calls. The flop comes down and Haxton checks. Lunkin checks behind. The turn is the and both players check again. The river is the . Check-check. Haxton shows and wins the pot.